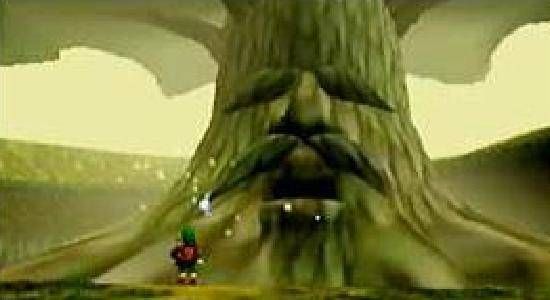 I started The Legend of Zelda: Ocarina of Time last night on the Virtual Console and worked my way through the Great Deku Tree in under an hour. From creating my saved game through the first temple in under an hour. It was quick. Don’t worry, I’m not going to go into a day-by-day diary of my play through of Ocarina of Time because this is going to take a long time not because the game is long, but because I’m going to be taking huge breaks and probably playing through only when I have a spare hour and nothing I want to get into. So, this is not Skyward Sword. What I want to briefly bring up for discussion is a thought I had last night working through the first 3D Zelda. Why did the game move so quickly at the start? Sure, Navi was an annoying distraction every time you would try and do something new, but you moved quickly from waking up to an annoying fairy to beating Ghoma in the Great Deku Tree and getting to the next part of your quest. As another example, Skyward Sword took me close to five hours to get to what might be considered a comparable place. This isn’t a knock against Skyward Sword (still thinking it is my favorite Zelda game ever … but not enough time between beating the game yet), but an honest question about why Ocarina of Time is so much quicker than Skyward Sword. What I came up with in the shower this morning was that Ocarina of Time had no legacy behind it which the game needed to “live up to”. A Link to the Past was decidedly a last-generation title (being 2D and all), but Ocarina of Time didn’t just usher in the first Zelda title on the N64, it was really the first true adventure game in 3D period and set the standard by which all other games would be judged (my opinion here). Because of that, Ocarina of Time was freed to be the best game it could be without really needing to live up to the past because you couldn’t really compared the past to the present (1998). However, ever since then, each Zelda game has carried the weight of Ocarina of Time with it, along with adding new legacies along the way. That’s just off the top of my head. I didn’t even include Ocarina of Time because I really don’t have enough time (or patience) to list everything. That’s a lot of legacy, and each one was under the pressure added from all of the past ones. I think that can sometimes slow things down a little bit because you are pressured into trying to maybe squeeze in more than last time and yet incorporate all that has come before. Just some thoughts I had this morning. As a closing thought, the control scheme for Ocarina of Time and Majora’s Mask was definitely tailored toward the N64 controller. The Classic Controller Pro is an okay controller, even lacking rumble, but the location of the analog sticks are somewhat problematic. I don’t have the option of using a Gamecube controller on my Wii, but it would be an option to look into if only to have the analog stick in a better place. Need to borrow a GameCube controller? I think we have 5, and only use 1 or 2 of them. Would love to, but the newest Wii hardware takes out the Gamecube controller ports along with the Memory Card slots. I did not know they did that. Interesting. And not terribly helpful, though possibly understandable. John Siracusa comments a little on this very topic in Hypercritical 50 and states that there is a point where you need to just drop ports in order to save any money and make things cheaper because you can only cut corners on actual I/O ports so much before you’ve tapped it out. I’m fine with it, not a huge deal, the Classic Controller Pro just leaves a little to be desired. It is too Playstation-esque for my liking, but it works for what it is meant for.